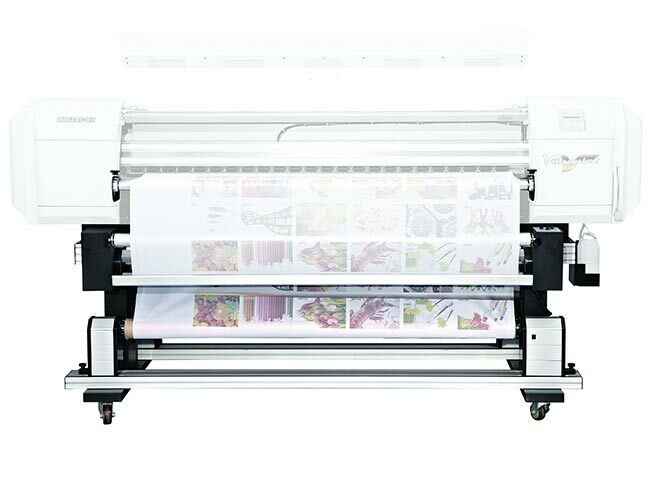 Textile take-up & feeding system is a roll-to-roll system to match digital printer. It is for rolling soften material without elasticity, especially chemical fabrics. 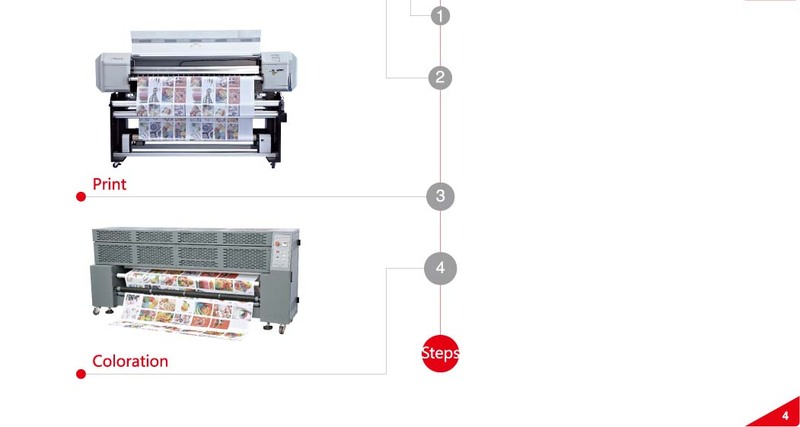 Before printing, tightening and tensing the fabric without elasticity, such as banners, flags, chiffon,etc, by front-real tension system and setting several traction roller. 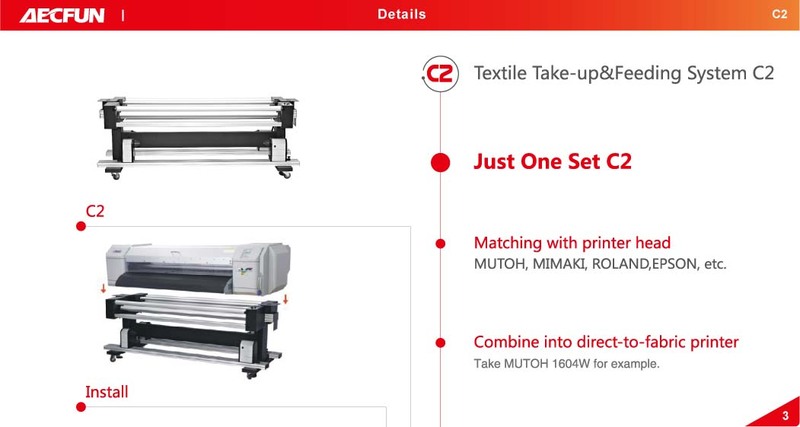 1.At present, mostly matched to MUTOH VJ1604 & MUTOH VJ1638 for banner fabric printing. 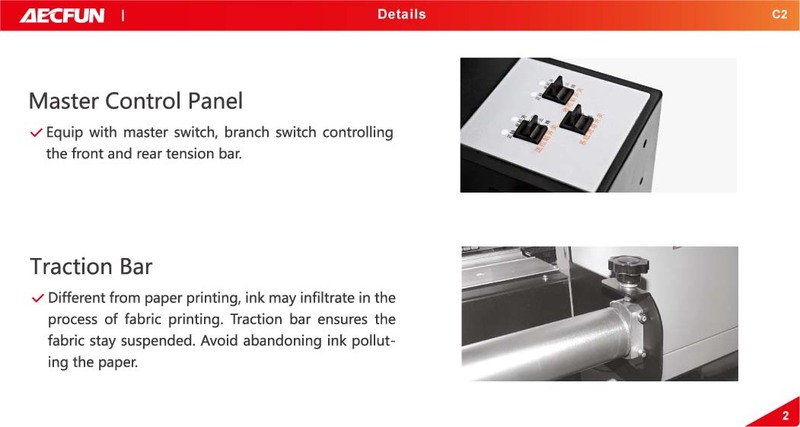 Also it is matched to ROLAND PRINTER RA640/RS640/FJ740 for leather printing. More than 50units purchased review from global clients. 1.Q:What is the function of C2 system? 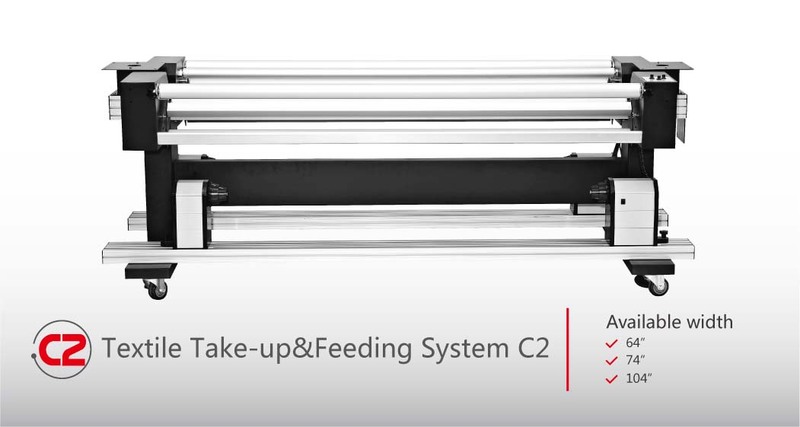 A:C2 is a set of print optimization devices and is a roll-to-roll system for supporting printers. The main purpose is to roll up soften material without elasticity, especially chemical fabrics. 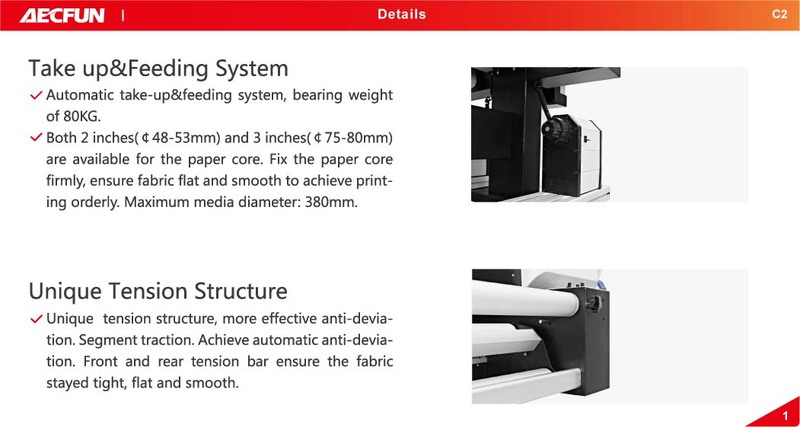 Before printing, tightening and tensing the fabric without elasticity, such as banners, flags, chiffon,etc, by front-real tension system and setting several traction roller. 3.Q: How about the bearing weight? 4.Q:What about the working voltage? A:Working voltage: 24V; Input voltage: 110V/ 220V; Four plugs optional: Chinese standard, British standard, U.S. standard, E.U. standard. 5.Q:How long is the warranty time? 7.Q:How many sizes can I choose? A:3 sizes now: 64”-1600mm /74 “-1800mm /104”-2600mm. 8.Q:Do you have the CE certification? A:Yes. It has matched with MUTOHVJ1604/1638 and ROLAND RA640/FJ740.